Junk bonds, also known as high-yield bonds, are bonds that are rated below investment grade by the big three rating agencies (see image below). Junk bonds carry a higher risk of defaultMarket Risk PremiumThe market risk premium is the additional return an investor will receive (or expects to receive) from holding a risky market portfolio instead of risk-free assets. The market risk premium is part of the Capital Asset Pricing Model (CAPM) which analysts and investors use to calculate the acceptable rate than other bonds, but they pay higher returns to make them attractive to investors. The main issuers of junk bonds are capital-intensive companies with high debt ratiosCost of DebtThe cost of debt is the return that a company provides to its debtholders and creditors. Cost of debt is used in WACC calculations for valuation analysis. Learn the formula and methods to calculate cost of debt for a company based on yield to maturity, tax rates, credit ratings, interest rates, coupons, and and early-stage startups that are yet to establish a strong credit rating. When you buy a junk bond, you are typically lending to the issuer in exchange for periodic interest payments. Once the bond matures, the issuer is required to repay the principal amount in full to the investors. But due to the poor financial state of the issuers, the interest payments may not be disbursed as scheduled. Thus, such bonds offer high yields to compensate for the additional risk. Image: CFI’s Free Introduction to Corporate Finance Course. Market analysts sometimes use the junk bond market to get an indication of the state of the economy. If more investors are buying them, that indicates that they are optimistic about the performance of the economy and are therefore willing to take on more risk. However, if investors are getting out of junk bonds, then that is a sign that they are risk-averseRisk Averse DefinitionThe risk averse definition the characteristic or trait of avoiding risk. This characteristic is usually attached to investors who prefer lower returns to and do not feel confident about the current state of the economy. This circumstance may be used to predict either a contraction of the business cycle or a bear market. The United States government started using junk bonds in the 1780s as a way of financing an unproven government. At the time, the country’s risk of default was high, and not many international lenders were willing to lend to the U.S. the investment offered high returns. Junk bonds returned in the early 1900s as a form of financing startups. Companies like General Motors and IBM were at their early stages at the time, and few banks was willing to extend credit to companies without a track record. In the 1970s and 1980s, the junk bond market experienced a boom due to fallen angel companies. Fallen angelsFallen AngelA fallen angel is a bond that was rated investment-grade but has since been downgraded to junk status due to the declining financial position of its issuer. The bond is downgraded by one or more of the big three rating services such as Fitch, Moody’s and Standard & Poor’s (S&P). were companies that had been issuing investment grade bonds before being affected by a drop in their credit profile, which lowered their credit rating to BBB grade. Research published by Braddock Hickman, Thomas Atkinson and Orina Burrell also contributed to the 1970s to 1980s boom in junk bonds. The study showed that junk bonds paid higher returns than was necessary to compensate for the extra risk involved. Drexel Burnham used this research to build a large junk bond market. Their investments grew from $10 billion to $189 billion from 1979 to 1989. The average returns for junk bonds stood at 14.5% while the defaults were only 2.2%. The junk bond market suffered a blow after the dominant player, Drexel, was brought down by illegal trading activities and eventually forced into bankruptcy. The United States junk bond market rose by 80% between 2009 to 2015, with its value estimated at $1.3 trillion. This was after the Global Financial Crisis of 2008, where high-yield bonds were linked to the subprime mortgage meltdown. The market grew steadily in 2013 when the Federal ReserveFederal Reserve (the Fed)The Federal Reserve, more commonly referred to The Fed, is the central bank of the United States of America and is hence the supreme financial authority behind the world’s largest free market economy. announced that it would begin tapering quantitative easing, which meant that it would only buy few Treasury notes, a sign that the economy was improving. Interests on investment-grade bonds started increasing, and investors took advantage of this to dispose of their investments on these bonds. Due to the improved economic conditions and fewer instances of default, investors turned to the junk bond market, which paid higher returns to compensate for the risk involved. However, by September 2015, junk bonds started experiencing turmoil again, with more than 15% of junk bonds being at distressed levels. They continued to fall in 2016 as investors moved back to investing in investment grade bonds amid the economic uncertainty propelled by unstable prices in the stock market. How are Junk Bonds Rated? Bond issuersCorporate InformationLegal corporate information about Corporate Finance Institute (CFI). This page contains important legal information about CFI including registered address, tax number, business number, certificate of incorporation, company name, trademarks, legal counsel and accountant. are given credit ratings depending on the likelihood of meeting or defaulting on their financial obligations. The creditworthiness of bonds is evaluated by the big three rating agencies, which include Standard and Poor’s (S&P), Fitch, and Moody’s. Bonds that are given a higher credit rating are considered investment grade and are the most sought after by investors since most are backed by federal governments. Bonds with a low credit rating are known as non-investment grade or junk bonds. Due to the high risk of default linked to junk bonds, they typically pay 4 to 6 points higher interest rates than investment grade bonds. 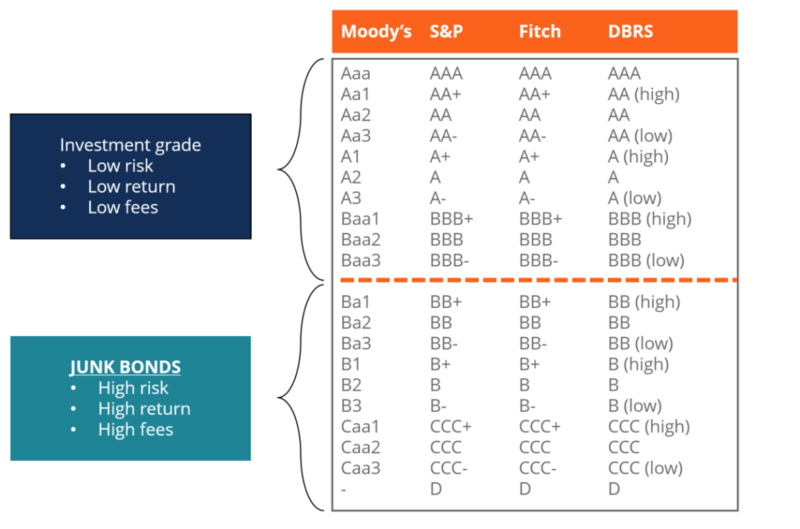 Based on the credit ratings of two of the big three rating agencies, junk bonds are those with a “Baa” rating or lower from Moody’s and a “BBB” rating or lower from S&P. Junk bonds with a “C” rating carry a higher risk of default while a “D” rating shows that a bond is in default. Most investors around the world buy junk bonds through mutual funds and exchange-traded funds. Mutual funds help reduce the risk of investing in junk bonds by offering a diversified bond portfolio. The returns for non-investment grade bonds fluctuate over time, depending on the issuers and the general state of the economy. Junk bond holders usually enjoy higher rates of return in a fixed-income portfolio as compared to other fixed-income investments. Since they are usually issued with 10-year terms, junk bonds have the opportunity to do better if the issuer’s credit rating improves during the expansion stage of a business cycle. If the issuer’s credit rating improves, then the value of the bond also increases and this leads to increased returns for its holders. Investors in bonds also get precedence over stockholders during liquidation, giving them an advantage to at least recover part of their investment in a case of default. Junk bonds have a higher likelihood of default than other types of bonds. In the event that a company defaults, junk bondholders are at risk of losing 100% of their initial investment. Also, junk bonds are affected by changes in credit ratings and interest rates. If a company’s credit rating deteriorates further, the value of junk bonds declines. When interest rates on investment grade bonds increases, junk bonds become less attractive to investors. During recessions, junk bonds suffer the most as investors run to conservative investments like gold, cash and treasury bonds that are considered safe havens. Bond IssuersBond IssuersThere are different types of bond issuers. These bond issuers create bonds to borrow funds from bondholders, to be repaid at maturity.